People fighting to reopen Standish Hospital in Gloucestershire as a community-run facility have failed after the site was sold. The Standish Mutual Care Trust had wanted to turn the 31-acre site at Stonehouse near Stroud into a centre for health and well being. But the Department of Health accepted a substantial bid from a healthcare firm. Spokeswoman Dr Karin Von Degenberg told the BBC she was "extremely disappointed" by the decision. "This is about the community, the community supported it but the government didn't listen to them. "Our plan would have even contributed to the new-style NHS, we'd have been a small part to that solution." Dr Von Degenberg added that although the group had been defeated they would keep the idea of a community hospital on the "back burner"
She added: "If there's any chance we'll go for it, but we've done everything we can for now. We can't do anything more." 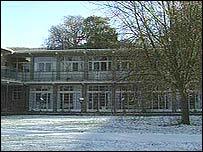 Standish Hospital, which closed in December 2004, specialised in orthopaedics, rheumatology and respiratory care.